Vickii Cornborough has spoken of her pride after making a surprise delivery to Havant Rugby Club. The England international, who narrowly missed out on Premier 15s glory with Harlequins on Sunday, called in with club-mates Abbie Scott and Joe Marchant last Wednesday. As part of the DHL Delivers Rugby initiative led by Quins’ sponsors, the trio handed out equipment to help develop the speed and agility of Havant’s female players. The kit included power bags, rebound nets, training poles and agility ladders, plus an inflatable ice bath. And former Admiral Lord Nelson student Cornborough, who moved to the Havant club from Portsmouth at the age of 15, was delighted to lend a helping hand. She said: ‘I used to play girls rugby for Havant, so it’s really nice to be back and be given the opportunity to deliver some essential rugby equipment. ‘I met the whole of the girls’ section – which is massive! The club has done a really good job. ‘It was basically like Christmas had come again for them and they started trying out everything they have been given. They were a bit unsure about the ice bath, though! ‘We stayed around and did a bit of a Q&A and got speaking to some of the girls. ‘For me, having played at Havant as a kid, it goes to show if you carry on playing rugby then you never know where you can get to in your career. ‘Harlequins have a switch programme and there is such an emphasis on building that next generation of female rugby athletes, pushing them through that player pathway, trying to encourage girls not to just try rugby for the first time but really get to enjoy it. ‘It was close to home for me and really special to be involved – having played there and coming from Portsmouth as well. 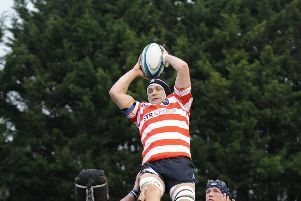 Cornborough featured in the Harlequins side which lost 24-20 to Saracens in the inaugural Premier 15s final on Sunday. Bognor’s Jess Breach scored a try for Quins but the south-coast duo could not prevent defeat. Cornborough believes it is a great time for young girls to get involved in the sport. She said: ‘When I started out aged five, I played boys rugby until I was 13. ‘That probably made me the player I am today – having the exposure to mixed rubgy. When I stopped playing with the boys, there wasn’t a lot of girls rugby – you had to travel a long way to find a team.